There are only five starting flights remaining for the $1 million guaranteed WPT500 London. Play one or play them all. The $1 million guaranteed 888poker WPT500 London Main Event only has five starting flights remaining, which means time really is running out if you want to become a World Poker Tour champion on home soil and get your hands on what will be a six-figure prize. All five of the remaining Day 1s take place at the Aspers Casino in Stratford Westfield, London and they all cost £420 to buy into. For that princely sum, you receive 15,000 chips and play to a 30-minute clock. Late entry is available for the first eight levels. 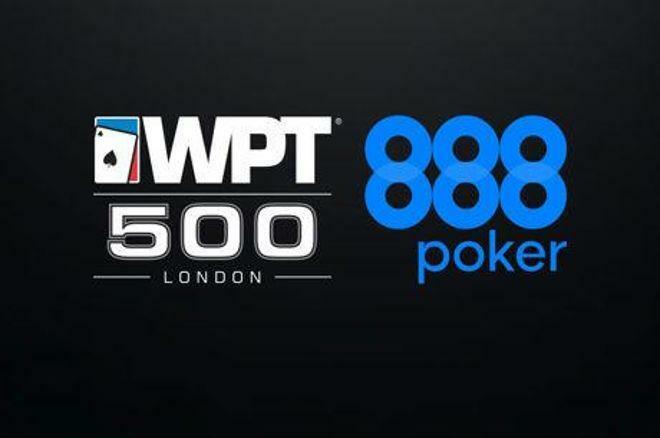 Play on the WPT500 London Day 1s continues until only five percent of the field remains. When this figure is hit, the curtain comes down on the day’s play and anyone with chips in front of them progresses to Day 2 and does so with $1,500 (£1,065) locked up. If you finish in the top eight percent of the field you’ll receive $1,100 while those finishing in the 12 percent of the field receive $900. These payments are made into your 888poker account with 48 hours of the tournament concluding. As and added incentive to play the remaining WPT500 Day 1s – as if playing for a share of $1 million guaranteed wasn’t enough – the first 88 players to register for the Day 1 on Mar. 29 will receive special limited edition 888poker merchandise. Those of you who are planning on heading to Aspers over the weekend may bump into the legendary Chris Moorman because he is making his way to London to try and qualify for Day 2. Make it through to Day 2 and you’ll be rubbing shoulders with 888poker ambassadors Sofia Lovgren and former World Series of Poker Main Event champion Martin Jacobson who both progressed from the online Day 1. High rollers among you need to head to Aspers on Apr. 1 for a £2,200 buy-in tournament. High roller specialist and 888poker ambassador Dominik Nitsche is playing in this event, can you stop him returning home with the trophy? Brits Dominate The Sunday Majors With Four Outright Wins!